There aren't many gravity-based games out there, but the niche genre is filled with surprisingly high percentage of quality titles. Gravitus, from kometbomb, is inspired by the likes of Gravitar, Thrust, and Solar Jetman, as well as Astroids. Per genre conventions, the player has a limited amount of fuel with which to complete his mission - and can only thrust in one direction - and the very act of staying aloft slowly depletes this precious resource. 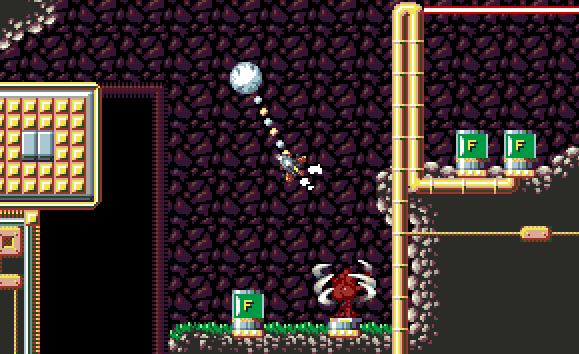 The player may find a few additional fuel pods along the way, but resource management is still key, as the player must maneuver through a tight system of caves while defeating enemies and eventually locate a heavy pod. As in Thrust, the difficulty only increases from this point, as the player must tow the pod back through the cave system, accounting for its weight and pendulum motion as it tugs against the ship, making maneuvering more difficult and depleting even more fuel. The game is coming to PC later this year. A beta demo is available on the developer's website.